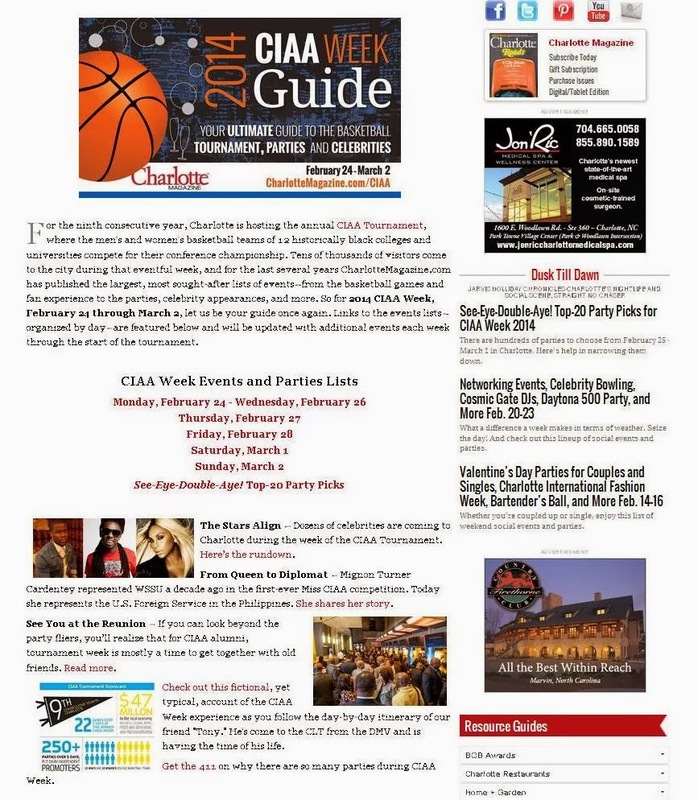 For the fifth consecutive year, I've provided comprehensive coverage of CIAA Week for CharlotteMagazine.com. Each year the parties lists get bigger, and so do the names of the celebrities who are coming to Charlotte to host them. You've likely already been checking out the content over the last few weeks--we began publishing the events lists at the end of January and have been updating them with additional events each week (shout out to Google for driving the traffic). And today, CIAA Week 2014 officially began. One thing I take pride in is showcasing the whole story of what CIAA Week is. Yes, for many of you it's about coming to Charlotte for a few days and partying your arse off. But there are also 12 men's and 12 women's teams from HBCUs competing for the CIAA basketball championship at Time Warner Cable Arena, and for many of those young people this is the highlight of their lives thus far. And for a lot of alumni from CIAA schools, this week is about reuniting with their former classmates and with their fraternity and sorority brothers and sisters. Some of them are the second or third generation in their family to attend a CIAA school. So when you visit CharlotteMagazine.com/CIAA, in addition to perusing the parties lists, take a few minutes to also read the articles about the reunion aspect of CIAA, and about how Miss CIAA 2004 is now a U.S. diplomat. A lot of African-American traditions haven't survived throughout our country's history. CIAA is one of them. Make sure you appreciate it.